Ali Clinton Band opened the evening of live music at The Flowerpot tonight, along with the excellent choice in real ale we're in for a high-octane rock driven set delivered with confidence and raw talent from this young band. Upfront delivering red-hot full-throttle guitar is Ali Clinton. This is a young band in a hurry to be noticed and they should be as they deliver a high quality set full of rock that is gritty, melodic and at times a dirty guitar sound. This was a great time to promote their new EP and this was successfully achieved a real reflection to the quality of music we heard as they sold out of all their copies and leaving people signing up for when they get some more. They delivered a mix of self-penned numbers including Second Time Around and Leave Me Alone and a couple of covers Deep Purple's, Black Knight and a wonderful medley of Led Zeppelin. This is a must-go-and-see band and you will not be disappointed as they just keep getting better delivering guitar driven rock. 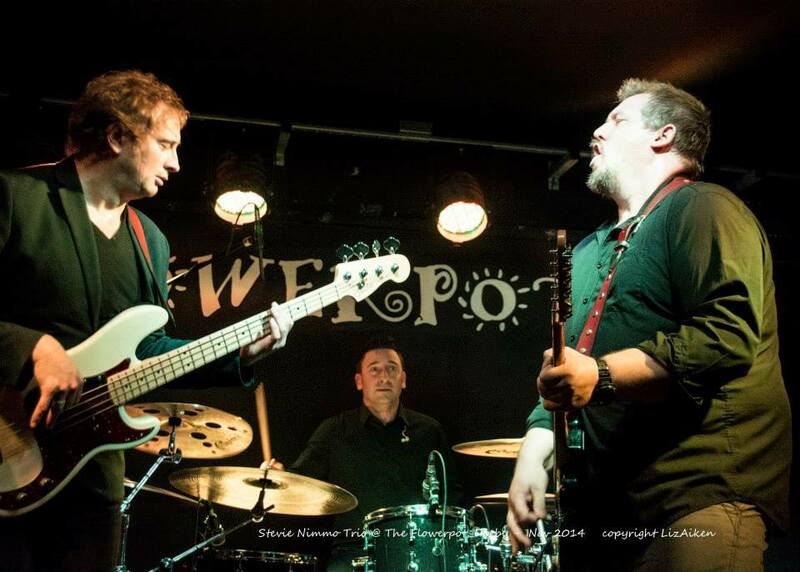 The ever popular Stevie Nimmo trio were given a rousing welcome back to The Flowerpot, we knew this was going to be a full-on electric no holds barred dynamic blues from the elder half of the Nimmo brothers. This new project is full of excitement, his natural way with the crowds, full of banter combined with guitar playing and his vocals with a grittier edge no wonder everyone was full of delight to be listening to a set full of music. This is a trio that really works with Stevie out front and then a rhythm section that understand each other and deliver every note on the musical journey of the songs delivered with Craig Bacon, Drums and Matt Beable, Bass. This is a trio who love playing together with some fantastic interplay between them creating a wall of sound deceptively simple to enjoy but made from layers of tones and textures. The stars of the show were the lead breaks from Stevie on guitar combined with his vocals, making this trio stand out from the crowded arena of electric blues. We had a glorious rendition of Big George's, who as a huge influence on Stevie, The Storm. I loved Good Day for the Blues from Stevie's latest album The Wynds of Life and the other tracks that were given electric treatment tonight. Electric blues were really showcased with class tonight at The Flowerpot, Derby this is a trio that delights every time.